Keep up to date with our Teach-Yourself Series – condensed articles on current and planned changes in South African migration law. Our articles and infographics aim to spread awareness on South Africa’s migration landscape, and our standpoints on the issue. This is a joint initiative between The Scalabrini Centre of Cape Town and Sonke Gender Justice. The first four topics in this series are: the Refugee Amendment Act, the White Paper on International Migration, birth registration and health care access. For further information about the issues discussed in the series, contact lotte@scalabrini.org.za or you can visit www.genderjustice.org.za. This article used several useful resources published by Lawyers for Human Rights, including the online handbook on Preventing Statelessness, and a pamphlet on Childhood Statelessness. You can watch a video about birth registration here. 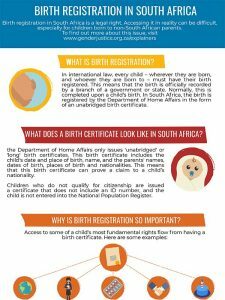 What does a birth certificate look like in South Africa? Why is birth registration so important? What does international law say about birth registration? What South African laws exist around birth registration in South Africa? What is late registration of birth? What are the barriers to registering births of non-national children in South Africa?